We received a free copy of the video to watch and review. I was thrilled. As a child I was such a fan of the books. On the shelf sits my yellowing complete collection awaiting new readers. 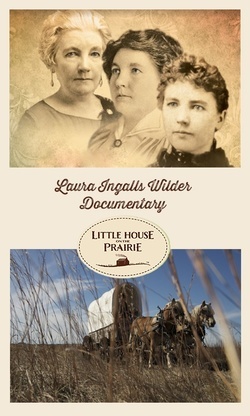 I gathered my tween girls and we spent a cloudy Saturday morning with cups of coco watching the life of Laura Ingalls Wilder evolve. 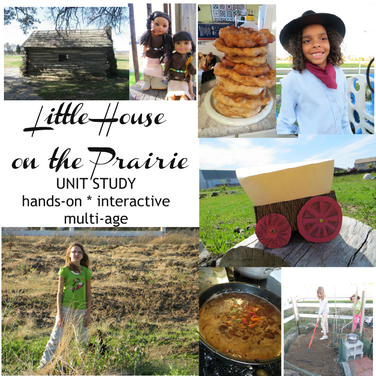 My four girls ages 9 - 12 love history and we have studied the United States westward expansion. Can you believe it - NONE of them have read the Little House series! This documentary was enjoyed even without reading the books. In fact, the second portion of the documentary gives an enticing summary of each book to encourage the children to continue reading through the series. My children picked up the fact that the author's greatest challenges were to inscribe her memories of hardship and heartbreak yet balance them enough to leave the reader feeling uplifted at the end of each book. We learn about Laura's life as a child, much of the information I gleaned from reading the books. However, the documentary continues to dive deeper into her life and relationship with her daughter. I appreciated that so much of her mother/daughter was new. I knew so very little about Rose. It surprised me the discussions it generated between my girls about their expectations of adult relationships between 'child and parent'. As the mother of many daughters, I appreciate the example set by Mrs. Wilder's persistence in struggle and her willingness to share successes. As the show concluded, we were left with an uplifted feeling at the close of the show. I asked the girls what was most memorable. Their answer was unanimously the awe that this woman who started her life (at their ages) crossing the Midwest in a covered wagon ended her life flying in a commercial plane to a speaking engagement. I this this documentary is a WONDERFUL introduction for my children to the series. As they pick up the books to read, they will have a greater appreciation for the stories they contain and the author's challenges to get them published.